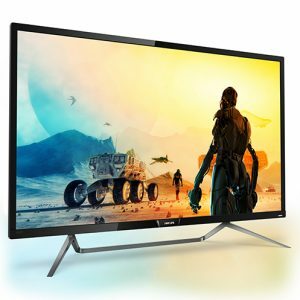 EPI is the company as well as brand license partner when it comes to Philips monitors, and they have recently announced the availability of the Philips Momentum 43” 4K HDR Quantum Dot Monitor. Also known by its model number 436M6VBPAB which is far harder to pronounce and remember, this happens to be the first DisplayHDR 1000 monitor in the world that sports the new Video Electronics Standards Association (VESA) DisplayHDR 1000 Certification. Certainly those who have a penchant for quality and certification will find this to be worth checking out. It is far easier to refer to this as the Momentum from here, where it will make use of several unique features that transforms it into a fantastic alternative as the centerpiece when it concerns the area of home entertainment. Capable of delivering a stunning viewing experience complete with Quantum Dot color, 4K resolution and exclusive HDR performance, users will be able to enjoy the high resolution and wide color gamut offered alongside 4K streaming services such as Netflix or VUDU from virtually any compatible streaming device. Apart from that, the Momentum will also work in such a manner where it increases the immersion experience of console gaming. Being far different from a standard TV, the Momentum is able to take advantage of Adaptive Sync, hence delivering tear-free console gaming, a very low input lag when it comes to fast-paced games as well as its famous Ambiglow technology that will deliver a whole new dimension when it comes to the entertainment viewing experience. Such technology is capable of projecting light downward around from the screen in a dozen colors, resulting in a beautiful ambient experience. The Momentum 436M6’s DisplayHDR 1000 Certification will allow it to showcase a wider range of more accurate colors, specially focusing on dark reds and greens, ensuring that what you see will remain crisp and clear even in bright light. It has a peak brightness of up to 1,000 cd/m2, and will arrive with an asking price of $999.99.